The Priority of Injustice: at last…. Clive Barnett’s The Priority of Injustice – just published by University of Georgia Press. 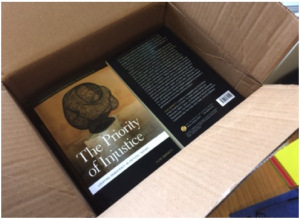 So, finally, the book that I have been writing, on and off, for the last four years, The Priority of Injustice, has been published – or at least, it’s real, I think the formal publication date is next month (so I reserve the right to blog further about it as and when). It arrived earlier this week – a rather hectic week, which has oddly meant I have been too busy to experience the strange sense of anti-climax that often accompanies the arrival of the finished form of something that you have been making for so long.